Mantle feathers of Namibian Violet Woodhoopoe Phoeniculus damarensis were examined by light and transmission electron microscopy. 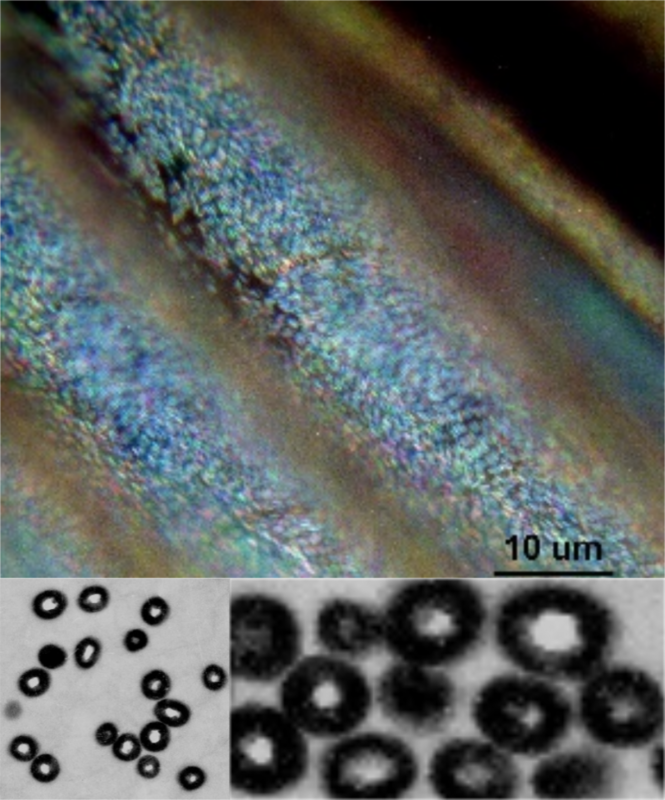 Iridescence of violet barbules and their biological basis were figured and discussed. The Violet Woodhoopoe P. damarensis has distinct coppery and violet mantle feathers (Cooper et al. 2017). The observation was arrived at independently and supports the observations of “Violet Woodhoopoes can be distinguished from Green Woodhoopoes by the colour of the mantle, which is dull to coppery in the former, but an iridescent green in the latter” (du Plessis in Hockey et al. 2005 loc. cit. du Plessis 2007). Here we provide some resolution for the biological basis of the Violet Woodhoopoe mantle feathers by examination showing microscopic details of some feathers. Mantle feathers were sampled from netted live Violet Woodhoopoe (Namibia: Hobatere and Omaruru; n = 9) in 1999. Mantle feathers were soaked for 30 min in 0.25 M NaOH, followed by 2 hours in formic acid: EtOH (2:3 v/v) and 3 days in 15 % (v/v) Spurr’s resin in propylene oxide. They were then embedded in Spurr’s resin. Both transverse and longitudinal sections of the barbules were cut, revealing that the iridophores of the species were hollow prolate cylinders. Iridophores cylinders were figured as tagged image file formats and compressed and converted into joint photographic experts group files. Mantle feather melanosomes from Namibian Violet Woodhoopoe P. damarensis are shown (Figure 1). Fig.1. Iridescence of a Violet Woodhoopoe *Phoeniculus d. damarensis* captured through a light microscope (left) and central distribution (centre) and peripheral distribution (right) through a transmission electron microscope. The melanosome surfaces of both the violet and green woodhoopoe mantle feathers appear to gradually change colour as the angle of view or the angle of illumination changes. The structures which interfere with the light are well known from the peacock (Zi et al. 2003). The type of melanosome appears to be randomly distributed within the feather barbule although there were layers at barbule surfaces. As Cooper et al. (2017) has shown it is the size of these structures themselves and the variation in sizes are hypothesized to cause the differences in iridescence which is to some extent present in the violet mantle feathers observed here. Although little sampling has taken place since Jarvis and Robertson (1997) in the last 20 years we support the idea the green and violet taxa should be considered separate and they are hybridising. Cooper MI, Sewell BT, Jaffer MA 2017. Differences between Violet and Green Woodhoopoe mantle feathers. Biodiversity Observations Vol 8.46: 1-2. Du Plessis MA, Simmons RE, Radford AN 2007. Behavioural ecology of the Namibian Violet Woodhoopoe Phoeniculus damarensis. Ostrich 78(1): 1-5. Jarvis A and Robertson T 1997. Endemic birds of Namibia: evaluating their status and mapping biodiversity hotspots. DEA Research Discussion Paper No. 14, Windhoek, Namibia.